The Alsek Glacier is a large glacier draining into Alsek Lake and the Alsek River. The first glacier upriver of Alsek Glacier flowing from the east and ending on the Alsek River valley floor is an unnamed glacier, here named North Alsek Glacier. The USGS topographic map compiled from a 1958 aerial image indicates a piedmont lobe spread out on the Alsek River lowland, without a lake, and a series of moraine ridges between the glacier terminus and the Alsek River. 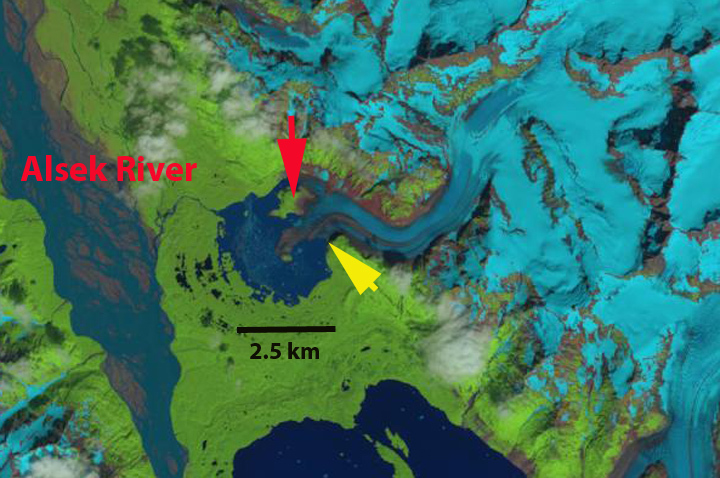 This glacier drains a series of peaks of 2000 m in elevation and drains directly west toward the Alsek River, blue arrows indicate glacier flow. USGS map indicating no lake at end of glacier. 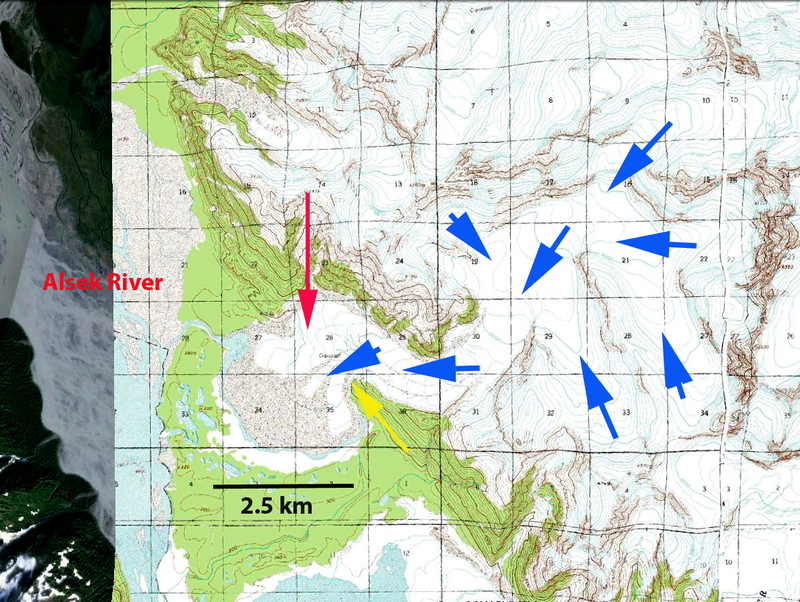 Here we examine Landsat imagery to identify the change in terminus position of the glacier from 1984-2013. 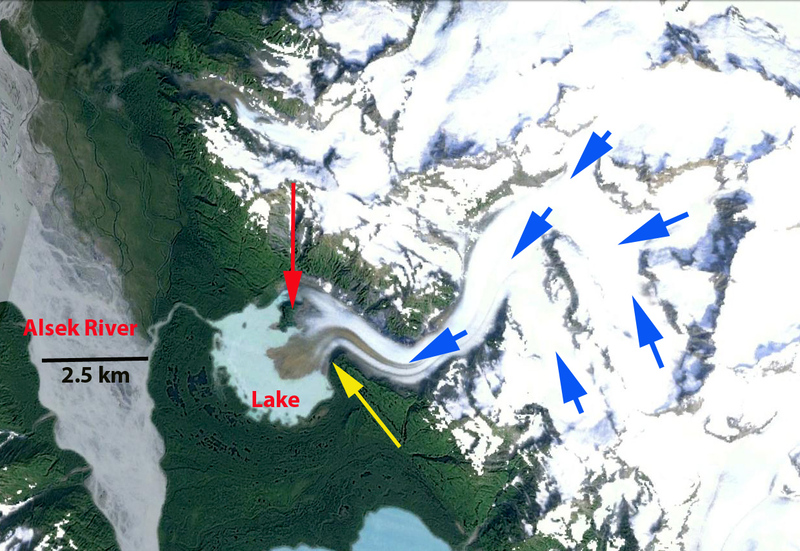 In 1984 a small lake has developed along the north shore of the lake that is 1000 m by 500 m. The glacier has retreated to a newly exposed knob, possilby and island, at the red arrow. 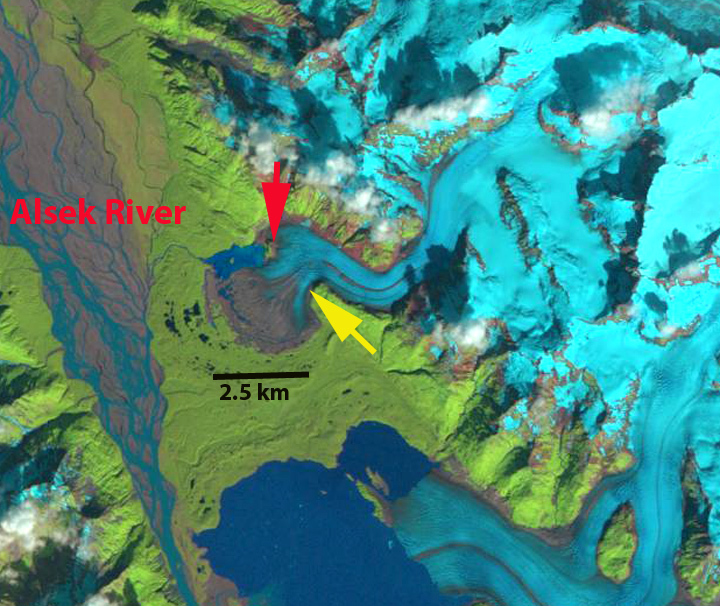 The red arrow in each image indicates the location of this knob, the yellow arrow indicates the 2013 terminus location on the south side of the glacier near the end of a peninsula. 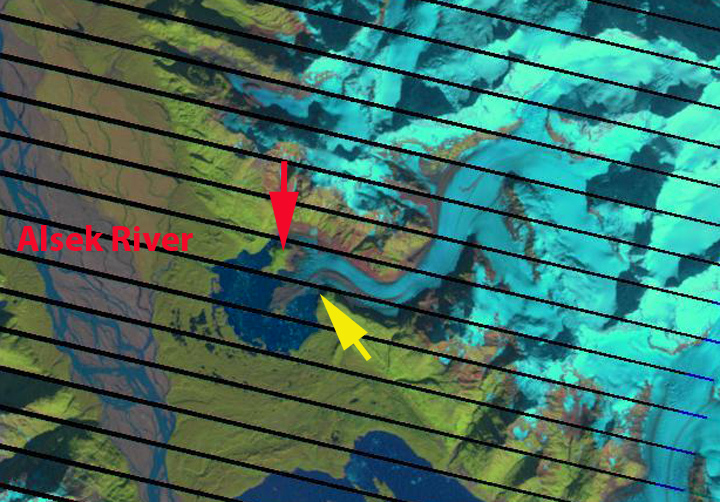 There is no lake downglacier of the yellow arrow in 1984. By 2011 the glacier retreat has led to development of a substantial lake that is 2.5 km north to south and 1.1 to 1.5 km side from east to west. In 2013 the central tongue of the glacier has continued to thin and breakup. The northern margin has retreated 2300 m from 1958 to 2013, the central margin 1500 m and the southern margin 1400 m. The majority of the retreat at the northern margin occurred between 1958-1984, while nearly all the retreat occurred after 1984 for the central and southern portion of the glacier. The glacier will continue to retreat out of the lake basin. The retreat has been nearly identical to nearby Walker Glacier that also had a piedmont lobe, but less than the nearby East Novatak Glacier and Yakutat Glacier. This entry was posted in Glacier Observations and tagged alaska glacier retreat climate chagne, alaska glacier retreat lake formation, alaska glacier retreat melt, alsek river glacier retreat, north alsek glacier retreat. Bookmark the permalink.